“Well. I followed my discretionary gut feeling and pounced on August put options this afternoon. I bought high this morning and lowered my cost basis this afternoon. Look for $1.15 to $1.50 in my trades. My target: $60 strike price. My Under Armour (UA) puts closed with a small profit but I played this position completely wrong. 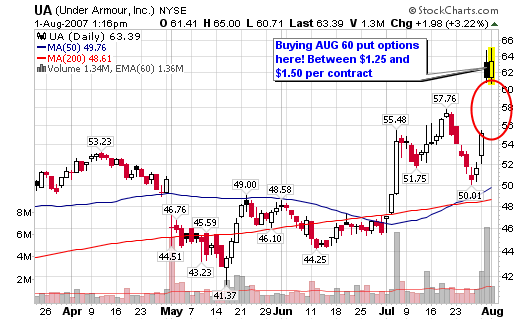 My cost basis was too high as the August 60 puts bottomed near $0.35 per contract. I jumped in too soon and didn’t allow the momentum to dry up before pouncing on the puts. They peaked above $5 yesterday around lunch but I doubt I would have had that maximum gain. The ideal trade would have been a cost basis down near $0.40 and a sell above $2.50 (this translates to a 500% gain). Well, these Apple (AAPL) puts which expire tomorrow but end trading today are now above $22 per contract. The options peaked for an 800% gain yesterday (if I actually bought them). Following your gut can cost you. JUST TAKE THE TRADE CHRIS! Oh well, let’s move on. I was screening and watching Under Armour (UA) in early 2006 for MSW but the stock never materialized into what I thought it could be. I love their products and always wear their gear when playing flag football in the fall and rafting the rapids in the spring. However, this has never translated into a profit for me as I just don’t trust this stock. Yes, it has been trending higher on a very slight angle over the past two years but it never worked out to be that homerun retail stock. I was thinking another Coach (COH) and I was thinking wrong. I just don’t buy into the stock, even with a solid earnings release and a strong gap-up on the charts. Well. 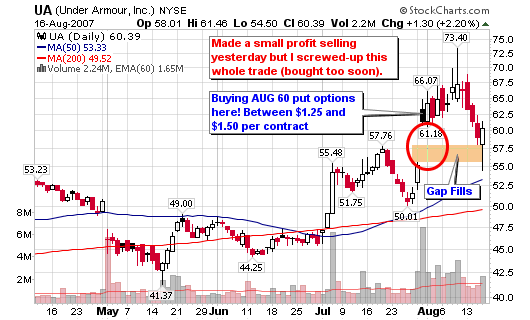 I followed my discretionary gut feeling and pounced on August put options this afternoon. I bought high this morning and lowered my cost basis this afternoon. Look for $1.15 to $1.50 in my trades. My target: $60 strike price. Why? 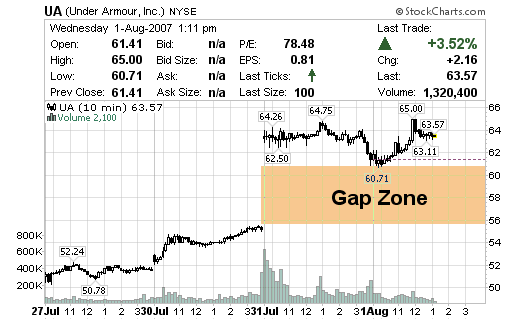 I am looking for the gap to fill after the earnings release. If the stock holds strong, I will roll them over to next month (if that’s the correct option terminology). The gap should fill; now I just need to nail the time frame and grab some profits. Maybe it won’t work but I tried. On another note, the AUG $140 puts for AAPL were trading at $2.55 last week and reached an intraday high of $13.40 today. It’s too bad I chickened out and never purchased them. I could have gotten out above $12 per contract for a 375% gain in one week. The Apple (AAPL) freaks scared me so I passed. 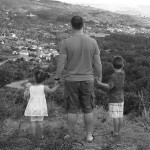 This is why discretionary can be costly! I decided to cut and run with my profits in my Nymex (NMX) call options. Take a look at the two images below to see the difference in prices from April to July in Jan 08 130 Calls. I no longer want to own long term based on takeover rumors that are on and then off. I may start to play the dips and grab more calls if the stock falls once again. Buying puts near the peak can be a play although risk is higher since a buy-out could actually happen. The Jan 08 130 calls have been swinging between $10.50 and $20.50 over the past couple of months. Not a bad scalp or swing trade without capital needed. A 52% gain in the Jan 08 130 option premium (I did buy the 130 at $13.50 and not the 135)! However, the stock only gained 6% in actual price as you can see ont he screenshots. 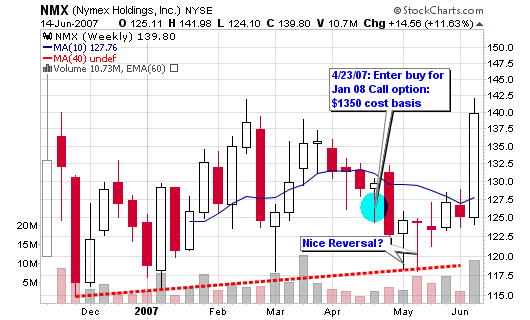 I wrote a post in early April, NMX Trading Decision: Shares or Options, and explained that I was looking to purchase call options: $130 Jan 08. I placed the order with a contingency but cancelled while on vacation because I didn’t want to worry about open positions that could hurt me. 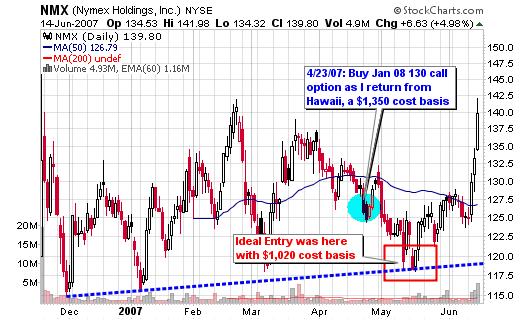 However, I did buy the 130 Jan 08 options when I returned from Hawaii but I paid a higher premium than I originally wanted. I ended up paying $13.50 for one contract or $1,350 cost basis (all I wanted was control of 100 shares for as little money as possible). The options dipped to a low of $10.20 last week (stretching to my stop loss limits in my account) and I was about to pull the stop loss trigger but I sensed strength among the options in relation to the actual share price. In addition, I saw that the weekly candlestick chart showed two consecutive weeks of positive reversals above the young trendline. Therefore, I decided to stick with the position because my original plan was to hold until the early winter of 2007. These same options blasted 100% higher over the past week and now show a 51% gain in my portfolio. The bid/ask closed at $20.20/$20.50 yesterday or total of $2,020. The stock is up more than $15 over the past three trading days and volume has exploded. With heavy action today, it will become the strongest accumulation week since the debut of the IPO (minus any unknown negative events). This is excellent action and can be a sign of things to come over the next six months so I will be sitting tight with my options. 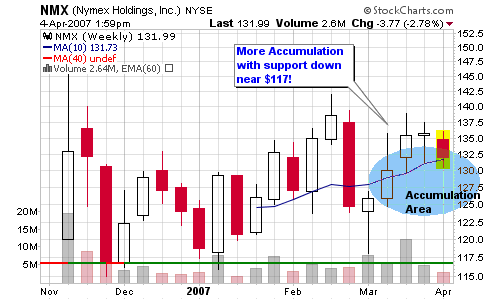 My research still shows a possible move to $170 by the end of 2007. This type of move would give the option a theoretical value near $40 (or $4,000). Early bid/ask numbers are in the $140 range so we will see where this thing goes! That would have been great but I didn’t do it. LONDON (MarketWatch) — Nymex Holdings share rallied in pre-market trades Friday on a report that the parent company of the New York Mercantile Exchange is shopping itself to larger rivals, according to a published report. Nymex (NMX) , the world’s leading market for energy futures contracts, has held talks to sell itself to NYSE Euronext (NYX) (NYX) , Deutsche Boerse (581005) or Chicago Mercantile Exchange Holdings (CME) , Bloomberg News reported Friday, citing two people involved in the discussions. Top Nymex executives have met with their counterparts at the three suitors, according to the report, and the board of Nymex has been informed of the talks. I have been blogging about NMX for several months (since December 2006) and have owned shares in the past but sold prematurely in March. I recently wrote about an accumulation area near $130 and the stock is currently trading within that area. However, I am not in a rush to establish any positions before my trip to Hawaii next week. I will have internet access but I don’t want to be on the computer or making any trades while on vacation so my hands are tied for two weeks. I want the stock but I would prefer a lower entry although it is not extremely important because the trade is long term. Dealing with possibilities; NMX could make a 50% run over the next year based on institutional accumulation and the success of sister stocks such as CME, BOT & ICE. I am not in the business of predictions so I can’t tell you if NMX will follow suit. So, instead of buying a lot of 100 shares for $13k, I am thinking about buying one January 08 call option (leverage my money for less exposure). Many of you already know that I am not the best investor when it comes to options as I have not had much success (compared to trading). Aside from one superstar options trade in Tenaris (TS), I tend to stick with buying and selling equities based on track records. I am looking to place a market order for 1 Jan 08 call option with a current ask of $12.20 or $1,220 (for control of 100 shares). I am also thinking about placing a market order to buy this same call with one contingent: the actual asking price must be trading lower than $125 (good til cancelled) while I go on my trip. It’s not much of a difference so I may just place the trade after posting this entry but a further correction is also a possibility (down towards $122-125). I don’t want to place the order with the contingent of $125 and have the trade miss the trigger while I am away and then make a run. That would really piss me off (especially if the ask came as low at $125.15 or so). What do you think? What would you do? I am very curious to hear your opinions (don’t worry, it won’t affect my final decision as my mind is already made up).